LIVE AN UNFORGETTABLE EXPERIENCE WITH SKYDIVE CENTER! ¡Dare to jump from an airplane! PURE ADRENALINE IN FREE FALL OVER 124 MPH! With a brief instruction (15 minutes) and you’re ready to make the tandem jump and enjoy the adventure surrounded by incomparable scenery and unique aereal view of Chascomus City. In our drop zone you can choose what kind of tandem jump you want to do, enjoying 45 seconds of freefall, for that we have two owned aircraft authorized for this activity. In Skydive Center we pride ourselves in providing high quality services, helping you to enjoy this adventure at it´s highest level, a challenge to your senses. Counting with high-quality equipments and a staff of highly trained skydivers, with more than 4500 jumps each, who will give you one of the most memorable moments of your life. 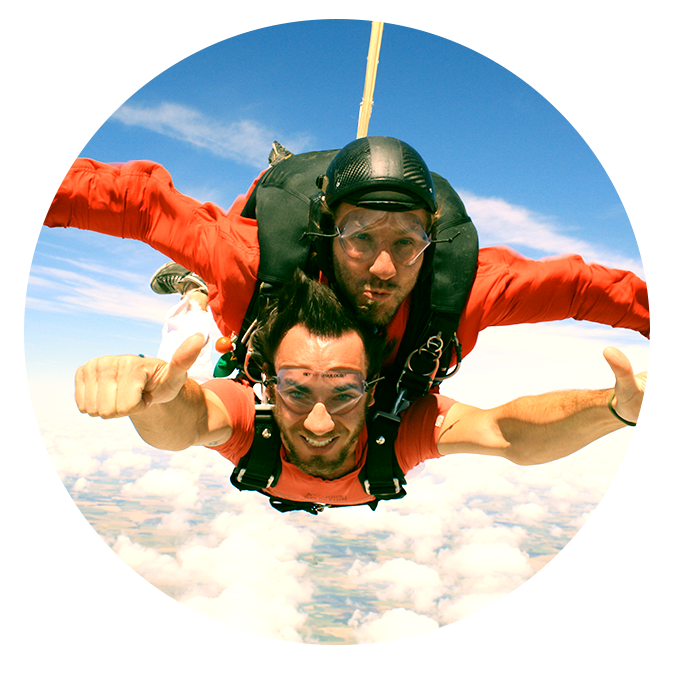 Also you will have the possibility that our professional photographers record this memorable moment, giving you a DVD with the video and pictures of your tandem jump in digital format. FLIGHT TIME: 15 TO 20 MINUTES. FREE FALL TIME: 45 SEC. OPEN CANOPY FLIGHT: 5 TO 7 MINUTES. AGE LIMIT: MORE THAN 17 YEARS OLD. Instruction: Our instructors will give you a 15 minutes explaination about all the concernings of the jump. Clothing: Everyday clothes and sneakers, our drop zone provides you goggles, gloves and jumpsuits. Reservations: By phone or e-mail with at least 10 (ten) days anticipation. Days of activity Backup Schedule: 8 pm to 20 pm. Jump shift: in order of arrival. Activity Time: A half day activity approx. Payment: Cash, in Argentinian Pesos, Dollars or Euros.